An object vibrates. The air molecules around it are pushed in waves by its movement. Some objects that these vibrating air molecules come in contact with begin to vibrate as a result of their contact with the air molecules. The objects then vibrate air molecules around them. The original vibration, or sound, moves outward, passing through air and objects with the power of the initial vibration. This is how sound works. But it is also a metaphor for how inspiration spreads. As a kid, I didn’t know that when I was obsessing over the movie The Black Hole, rocking out to “Surrender” by Cheap Trick, reveling in the cool sounds of the Xanadu soundtrack, or making an inept attempt to dance to the Jacksons’ “Shake Your Body Down to the Ground,” I was, to some degree, being buffeted by the creative efforts of session musician, synthesist, and composer Michael Boddicker. These moments were among those that inspired me to pursue music and synthesis. Since Michael’s work helped excite my interest in the synthesizer, the work of Michael Boddicker helped inspire my career. In other words, I was an object being vibrated by the waves of inspiration that were coming from other objects. 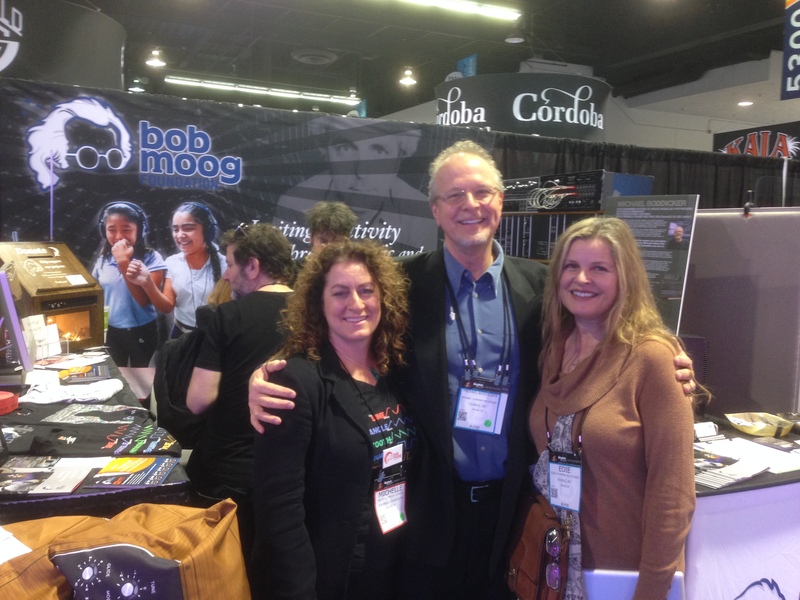 So it was particularly rewarding to demonstrate Michael Boddicker’s titanic Moog modular, the synthesizer that could be described as foundational in my life and career, at the Bob Moog Foundation booth at NAMM 2015. It was a visceral experience to be performing and teaching with a device that, to some degree, made me capable of and interested in performing and teaching. More rewarding that that, though, was being able to see this device work its magic on those who were experiencing it in our booth. The visitors to the Bob Moog Foundation booth were delighted by the sensory experience of the device, but were also very interested in its functionality and application. Some of them stayed for in-depth demonstrations of operation as well as extensive descriptions of its history. It seemed like nearly everyone who passed needed to have their picture taken with the synthesizer. No one, from the experienced musician to the casual passer-by, seemed to escape the inspiring power of this mammoth musical instrument and the music it had made that affected their lives. 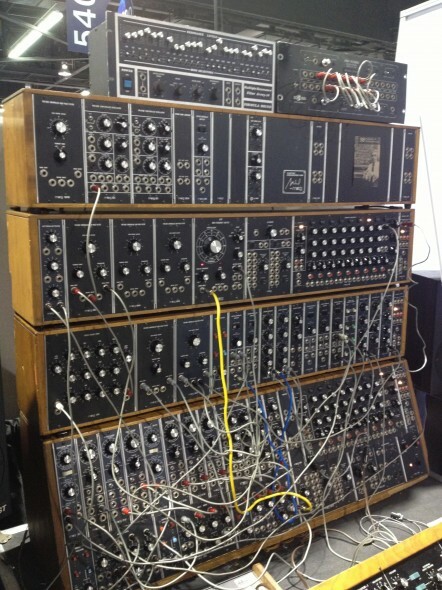 created by Robert Arthur Moog. And really, this is the core of our work at the Bob Moog Foundation: the knowledge that Bob Moog’s work inspires innovation, creativity, and joy. 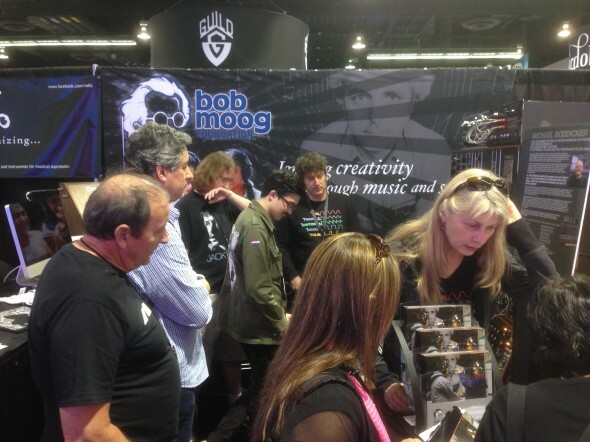 What better proof of this than the throngs of visitors to the Bob Moog Foundation booth who were moved, fascinated, and excited by the instrument he created, and its power to inspire a talented musician? For us, Bob Moog is the original vibrating object in the sound paradigm above, and his vibration is strong enough to send waves of inspiration that move from one person to the next, ad infinitum. This is what inspires and guides our work. 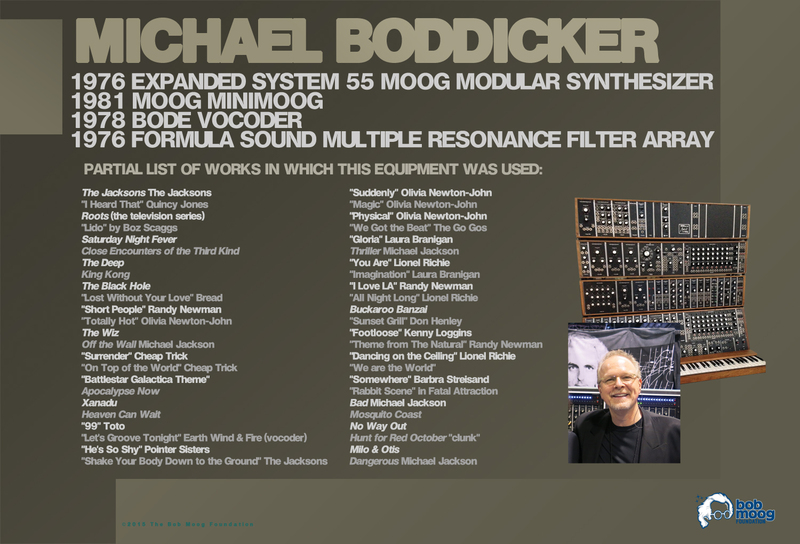 Thanks to Michael Boddicker for his incredible contributions to the Bob Moog legacy, and especially for his willingness to help us spread that legacy with his name, work, and amazing synthesizer.